I often argue that the home vegetable garden is the ultimate wellness tool. 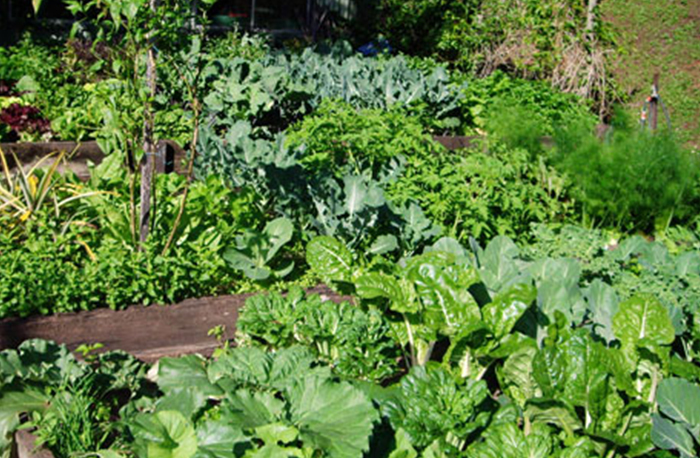 In a world of bastardised, denatured, industrial food, the veggie plot represents a rare opportunity to reclaim responsibility for your own nutrition. The production and consumption of home grown food offers more than forgotten flavours and nutrient dense medicine, it can also serve as a meditative communion with nature to soothe the inherent stress of Century 21. It is really important, if you are a gardening virgin, that you succeed with your first attempt or it is quite likely that it will be your last. A new garden overflowing with spotty, straggly, insect-infected specimens is not likely to inspire further ventures. That is why we have developed the Life Force® Home Garden Range and the associated Three-Step Nutrition Gardening® System. Anyone can grow great vegetables with this system and they should then be “sparked” to continue as impassioned producers of fine food. Even seasoned vegetable growers are surprised at the scale of their success when experimenting with this system. When I returned from a business trip to Indonesia and a seminar tour of South Africa a few years back I found that my “Life Force” garden had flourished in my absence. I have grown accustomed to disappointment upon returning home from a few weeks abroad as family members often overlook or underwater my garden plots. However, this was the first time I had actually followed the full three steps. My garden has been the recipient of each of the Life Force® products as they were developed, but I had never put them together before. I believe that the big difference was the inclusion of Life Force® Micro-Force™. This is a blend of beneficial microbes that is “brewed” in a 20 L bucket overnight before application to the soil. I had been trying to achieve a much-desired crumb structure in my soil, where plant roots can move unimpeded, water infiltrates well and oxygen can freely enter to supply the requirements of the beneficial soil microbes (all of whom are highly aerobic). Upon my return from overseas, I had finally achieved my goal. I could push my hand deeply into a beautifully particulate soil that smelt good enough to eat. Life Force® Micro-Force™ contains organisms that harvest free nitrogen from the atmosphere. It features friendly fungi that promote plant growth while improving resilience. This microbe blend also contains billions of organisms that improve the uptake of minerals from the soil to the plant. The more minerals we can deliver to the plant, the more intense the flavour and the greater the medicinal value of the food you are growing. The starting point in the three-part plan is to remineralise and balance your soil. This is achieved with a complete, composted fertiliser called Life Force® Gold™. This blend includes good levels of all major and minor minerals and broad-spectrum mineralisation derived from the concentrated ash from ancient plant material. All 27 components are composted to boost their nutrient availability and to introduce humus and microbes into your garden. The soil life is further boosted with the addition of Life Force® Instant Humus™, which involves a remarkable natural promotant called humic acid. These soluble humate granules are simply dissolved and the tar black soup is watered onto the garden before planting. Humic acid complexes minerals to prevent them from leaching and it magnifies their uptake. Life Force® Micro-Force™ involves freeze-dried organisms in a powder that is added to a bucket of water and aerated overnight with an inexpensive fish tank aerator. This completed microbe brew is then diluted and applied immediately after planting. When a new microbe workforce is introduced like this, it is always a good idea to send them off to work with a lunchbox of good quality food, so they hit the ground running. The lunchbox in this case is a product called Life Force® Organic SeaChange™. This is a proven combination of liquid fish fertiliser, seaweed and fulvic acid that provides the perfect food for both the new workforce and the existing organisms in your soil. The aim is to feed fungi, which in turn attract protozoa, which will herald the arrival of numerous earthworms seeking this microbe feast. The more earthworms, the better, because these creatures are virtual fertiliser factories. Everything that comes out of their rear end contains several hundred percent more nutrients than what went in the front end. NTS are internationally renowned for our precision Nutrition Farming® approach in intensive horticulture and we have utilised this knowledge and experience to bring you two mineral-packed, ACO registered, organic liquid fertilisers for the home garden. Life Force® Organic Boost™ offers a wide range of nutrients, including organic nitrogen, trace elements, kelp and natural plant growth promotants, in a concentrated liquid. Dilute 2 capfuls (30 mL) into a 9 L watering can and mix well, then wet the leaves and soil thoroughly. 9 L diluted covers approximately 4 m2, and applications should be repeated every 2 weeks. When it comes to flowering and fruit filling time, apply 1 capful (15 mL) of Life Force® Organic Blooms™ to a 9 L watering can and apply over the soil, taking care to avoid sensitive foliage. 9 L diluted should cover approximately 4 m2, and applications should be repeated every 2 – 3 weeks during flowering and fruit filling stages. This program may seem a little more involved than simply chucking on the chook manure pellets and hoping. It is based on 20 years of work in high production horticulture and it can deliver fruit and vegetables like you have never grown before. The importance of growing your own nutritious food cannot be overemphasised in a world swimming in processed denatured food laced with preservatives and chemical residues. The garden is the ultimate wellness tool and the Life Force® system is designed to ensure that food production is both satisfying and rewarding. If you have any queries about how to boost the vitality and health of your home garden, lawn, fruit trees, vegetables or flower bed, please contact the NTS Agronomy team on +61 7 5472 9900 or sales@nutri-tech.com.au. Click here to check out the Life Force® Home Garden Range website. Click here to download our FREE Gardener's Guide booklet.